The Long Now Foundation uses five-digit dates to guard against the deca-millennium bug (the “Y10K” problem) which will come into effect in about 8,000 years. As you may have noticed any reference we make to a year begins with a zero: 01977, 03012, 02000, 00521, 01215, etc. It’s an idiosyncrasy to which we are dedicated. It’s nerdy fun, but it has a serious point, too. As our co-founder Stewart Brand points out: the present moment used to be the unimaginable future. Long Now is fond of metaphors. Our 10,000 year Clock will begin to keep time at some point in the future, but it functions today as a viral idea carrying a long-term thinking payload. Once you are aware of the effort to build a clock that will last for 10 millennia you can’t unthink the flood of details that come to mind about that endeavor. “Big Time” becomes more tangible and hopefully you gain perspective on the small chronological units we typically give such weight to in our daily lives. Our zero is for optimism. The notion that the externalized thoughts we write today may survive myriad years to a time when that fifth digit becomes significant. If we hope to grasp anywhere near that ambitious reach, it will require some forethought. Our five-digit dates represent that. How can we invest in a future we know is structurally incapable of keeping faith with its past? The digital industries must shift from being the main source of society’s ever-shortening attention span to becoming a reliable guarantor of long-term perspective. We’ll know that shift has happened when programmers begin to anticipate the Year 10,000 Problem, and assign five digits instead of four to year dates. 01998 they’ll write, at first frivolously, then seriously. A sense of humor can be a useful sweetener for novel ideas. We hope the five-place-date draws attention to a larger view of time. And if it inspires a grin in the process that’s perhaps even better. Our technology has come in layers. You are able to read this sentence because generations of programming has built upon binary foundations. Today’s engineers stand on the shoulders of giants and construct protocols, operating systems, programming languages, data formats… so those who follow can continue the process. And that might suggest there’s an inherent awareness of the future. But if the long view and big picture aren’t considered this chain of code can be its own trap. Technology has blind spots. Hard code can be brittle. The “Y2K bug” demonstrated this. While that experience may seem fresh, there are already people writing code who were too young to take that lesson first hand. So think of the extra digit as presupposing the future with a view to realizing our best potential. And underlining the need for considered preparation at an appropriate scale: The Big Here and Long Now (Brian Eno). 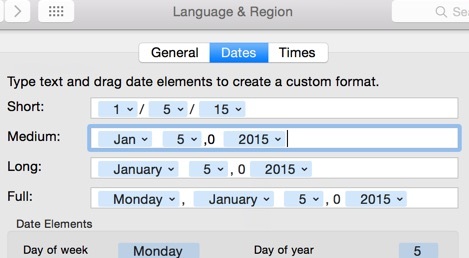 At the cusp of a new year, it’s a great time to tweak your Mac’s clock display for 5-digit dates. 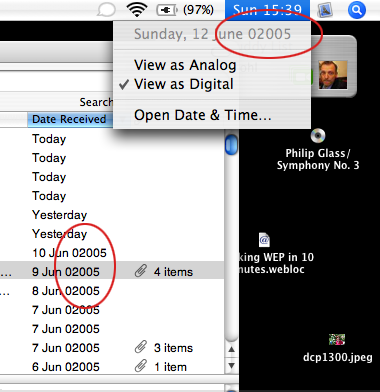 In 02007 we first noted this post by a Long Now fan which itself dates to 02005. There are various approaches for displaying leading 0’s on other OS’s. If you have one please post it in the comments. You’ll notice that since we’ve originally posted this we’ve figured out a way to use 5-digit dates on our WordPress blog. Kudos to WordPress for making this easy: just add a zero to the URL pattern in the admin panel. If you’re interested here are more geeky details about how we implemented it. Feel free to fork and improve it!